Andy heads up the team, overseeing the CMU bulletins, website and podcast, managing social media channels, reporting on artist and business stories, and writing the CMU Approved column. Chris provides music business coverage, writing key business news and analysis. Chris also leads the CMU Insights training and consultancy business and education programme CMU:DIY, and heads up CMU publisher 3CM UnLimited. Caro helps oversee the CMU media, while as a Director of 3CM UnLimited she heads up the company’s other two titles ThisWeek London and ThreeWeeks Edinburgh, and supports other parts of the business. 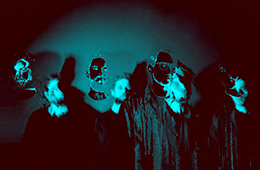 Contributors: Aly Barchi, Dan Le Sac, Eddy TM, Marc Samuels, Paul Vig. You will also find reviews in the CMU archives from: Abi Willey [AW], Adam Strandt [AS], Andy Malt [AHM], Caro Moses [CM], Cat Gordon [CG], Daisy Harriet [DH], David Jones [DJ], Duncan Geere [DG], Emily Gosling [EG], Gav Murphy [GM], Georgina Stone [GS], Gordon Bruce [GB], Harry Haste [HH], Ian Marshall [IM], Isabelle Amazon-Brown [IAB], Jadie Leigh Troy-Pryde [JTP], Josh Baines [JAB], Jane Wright [JW], Kevin Wilson [KW], Marc Samuels [MS], Maria Buckley [MB], Michelle Yong [MY], Mike Ellis [ME], Owen Smith [OS], Patrick Glen [PG], Paul Vig [PV], Samir Gelu [SG], Seri Davies [SD], Sophie Keys [SK], Stephen Smith [SJS], Terri Williams [TW], Thomas Meek [TM], Tom Ayres [TA], Tom Clinton [TC], Tom Hawkins [TH]. Web Stuff: Chris Cooke, Alan Ogilvie, Sam Taylor. Founders: Chris Cooke, Alastair Walker, Fraser Thomson. All content © UnLimited Media 1998-2018. The CMU websites are powered by WordPress with a template produced by Dropshop. CMU job opportunties are advertised on the CMU jobs page. 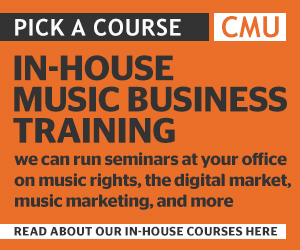 CMU Editor Andy Malt and CMU Business Editor Chris Cooke are both available to comment on music and music business stories. Together they have provided comment and contributions to the likes of BBC News, BBC World, BBC Radios 2, 4, 5, 6music and Scotland, Sky News, CNN, Monocle 24, Wired and the Associated Press. Email andy@unlimitedmedia.co.uk or chris@unlimitedmedia.co.uk. Click to read CMU’s sister media ThisWeek London and ThreeWeeks Edinburgh. Click to find out more about the 3CM UnLimited group and its companies UnLimited Media, UnLimited Learning, UnLimited Insights and UnLimited Live. There are more details about CMU advertising and sponsorship opportunities here. For advertising enquiries email ads@unlimitedmedia.co.uk or call 020 7099 9060. All editorial content on the CMU websites is © UnLimited Media 1998-2018. The copyright on any audio or video content is owned by the relevant labels and publishers. Any data supplied when subscribing to a CMU publication will be held according to UK data protection law, and will not be shared with any external parties. Information on how to unsubscribe from any CMU media is supplied at the bottom of said media. Click here for our full Privacy & Data Policy.